Reduced income while your expenses remain the same. Debtors who have suffered a job loss, salary reduction or have taken a job with compensation lower than what they’ve become accustomed to, may need to file bankruptcy. Reduced income over the short-term may be tolerable but long-term is another matter. Bankruptcy will help debtors discharge their debt while they adjust their lifestyle to their new income. The inability to save a significant amount of money. If a debtor does not have at least $100 to $200 surplus in their income available for saving, they may need to file bankruptcy. The inability to save is one of the leading causes of financial difficulty. Emergencies are inevitable, and without emergency savings, a debtor will need to incur more debt when an emergency takes place. Filing bankruptcy will eliminate recurring bills such as a credit card or other unsecured debt while freeing up more money for savings. A messy divorce. Divorce can upset the financial well-being of both partners, especially if there are children involved. It is more expensive to maintain two households than one and the litigation costs associated with a messy divorce can create more debt. Filing for bankruptcy after divorce or even before divorce can help minimize some of the financial damage that inevitably takes place during divorce. Using debt to survive. 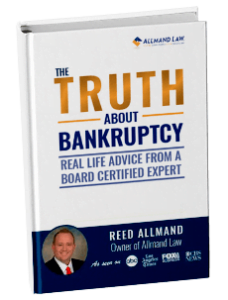 If a debtor is using debt to pay their daily expenses, then they probably need to file bankruptcy. Using “survival” debt is a sure sign that you are financially drowning and the best way to get out of trouble is by filing bankruptcy and discharging your unsecured debts.